The events that unfolded in the center of Kyiv in midday on February 18 could surprise a foreign observer unfamiliar with the realities of today’s Ukrainian life. Meanwhile, ones who know them even a little bit could be pushed to draw some conclusions. Judge for yourself: at the end of the fourth year since the revolution, the memorial day of the heroes who died in it is approaching. It is expected that a number of mass events will be held in the capital, where the memory of the heroes will be honored and people will be reminded of their self-sacrifice. The last, however, is hardly necessary, as not that much time has passed, and their deed is remembered by everyone anyway. Indeed, there were many such events on the Maidan and in its environs. 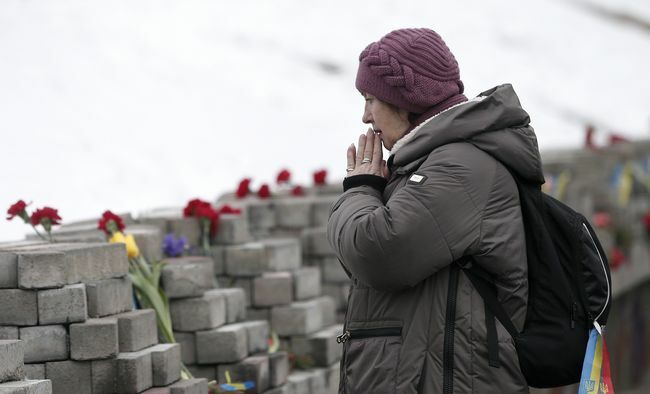 They included a prayer service on the site of the deaths of a significant portion of the Heavenly Hundred, a memorial event for the fallen in the Battle of Debaltseve, and a theatrical performance... But there were surprisingly few people present. It is unlikely that Kyivites and guests of the capital were put off by moderate frost and snow. Rather, the closing of the central stations of the Kyiv Metro played a role, which made it difficult for many to get to the location of commemorative events. According to the media, an anonymous report was received alleging that these stations had been mined, which led to this result. Far be it from me to use this article to reproach the municipal authorities for something, but still, it seems like it would be worthwhile on such a day to provide citizens with as many opportunities as possible to pay tributes to the memory of the heroes. However, some colorful and notable events did take place on the day, but they were only very distantly connected to the Heavenly Hundred. The Organization of Ukrainian Nationalists volunteer movement announced in advance its intention to march under the motto “Death to Russia” to the Russian Federal Agency for the Commonwealth of Independent States, Compatriots Living Abroad, and International Humanitarian Cooperation (Rossotrudnichestvo)’s building in Borysohlibska Street. That was exactly what the nationalists did, and they also broke windows and a glass door in the building. They met no strong resistance on the part of the police. A little later, nearby Sberbank and Alfa Bank offices in Sahaidachnoho Street were given the same treatment. As you know, both banks are Russian-owned. Many more people were attracted on the day by another March for the Future. The media often call its participants “supporters of Mikheil Saakashvili,” but describing them as “opponents of Petro Poroshenko” seems to be more accurate. At first glance, their numbers were significantly higher than during the previous march, held on February 4 (and this is despite Saakashvili, who is a charismatic and very skilful agitator, taking part in the event then, while he has been quite far away from Ukraine lately). Perhaps the statement of the march’s leader Ivan Slobodianyk, who asserted that “tens of thousands” attended it, was an exaggeration, but the demonstrators turned out to be numerous enough to fill the vast Mykhailivska Square. At the rally, the Vyzvolennia newspaper was actively distributed. Its first page read as follows: “We are soldiers and officers of volunteer battalions and the Ukrainian Armed Forces. We have returned from the front and see arbitrariness, thievery, and deception...” It sounded true, as people in camouflage uniforms were really quite numerous in Mykhailivska Square. Let us recall that a considerable number of them have been “besieging” the building of the Verkhovna Rada for months. Of course, this rally, too, commemorated the heroes of the Heavenly Hundred and honored their memory with a minute of silence. However, the speakers, including the famous dissident Stepan Khmara, attacked primarily the incumbent authorities. By the way, Khmara demanded that Kyiv mayor Vitali Klitschko immediately remove from Independence Square metal structures with portraits of the Heavenly Hundred, which make this place inaccessible to mass protests. Otherwise, Khmara threatened to launch a campaign for firing Klitschko himself. The square responded with an enthusiastic shout. The rally in Mykhailivska Square was not the end of it. After it, many attendees moved across Independence Square (where, at that time, people were preparing for a theater-like show) and then down Instytutska Street to the tent city outside the Verkhovna Rada building, which has been safely staying there since last October. From there, several hundred protesters headed for the turn from Instytutska Street to Bankova Street which is always blocked by the police: in other words, they headed to the passage to the office of the president of Ukraine. They were clearly not strong enough to break through the police cordon, and they did not even try to. The other side also behaved extremely peacefully. There were no incidents, and soon the demonstrators calmly dispersed. Let us take a breath and sum up the preliminary results. The figures of the heroes who died for a just cause are always extremely attractive, and politicians always try to earn points by associating their names with their own. It is so common that one does not need to pay attention to it, one just has to accept the fact that politicians cannot be different. However, ordinary citizens are well aware of this truth, and prefer in such situations to stay away from the leaders and aspiring leaders. To honor the memory of the dead is worthier and safer, it usually attracts far more people. Why did it turn out differently on February 18? Most likely, the reason is as follows. It is only natural to put the heroes and martyrs of a revolution on a pedestal when the revolution itself has already been completed, its tasks have been fulfilled, and its place is only in the history textbook, even if it is a recent event. This cannot be said about contemporary Ukraine, as it is in many respects in the same place where it was in November 2013. The Revolution of Dignity changed the government, but did not create functioning mechanisms of influencing it. More precisely, there is such a mechanism, but it is too radical. To build barricades, set bonfires in squares, and fight with the police every time is generally too costly, and in wartime even more so. Yes, Ukrainians showed the capacity for self-organization in those days, but it was not enough to impose their conditions on the ruling class. It is not about Poroshenko’s personal virtues or flaws. If put in his shoes, maybe not everyone, but definitely almost everyone would be doomed to behave like he does: to think that the revolution is over, to see the meaning of this revolution in his personal ascent to power, and to put this power in the service of those circles that ruled the country before the revolution, and against which it was directed. Poroshenko has been just a hostage to his role. But politically active Ukrainians (and their numbers are increasing) do not want to accept this role at all. It is this that is important, and not the fact that Saakashvili muddied the water until recently. The Georgian ex-president could be sent to Poland or to the Netherlands, or even to Mexico, together with an ice pick just to be sure, but this would not change anything. On February 18, the protest did well without him. The problem is elsewhere: a significant number of people want to live in a Ukraine without oligarchs, while constantly observing around themselves a Ukraine with oligarchs. The first inevitably contradicts the second, and the root cause of all protest events is precisely here. The question is whether it will be possible to solve the task of revolution peacefully, that is, to create institutions through which Ukrainian society could control the elite. Apart from the peaceful way, there are others, but their price would be too high, and it would be so for us all.